Opening day at Vail on Wednesday saw spring-like temperatures, loads of soft snow (by early-season standards) and a relative lack of crowds – especially given that cars filled both parking structures and spilled out onto South Frontage Road. Day one at Vail on Wednesday, with Holy Cross in the background. By the time I got there around 11 a.m., the snow riders were pretty spread out across the available 600 or so skiable acres. Great to have Vail Village access via Gondola One on opening day, which was actually moved up by a couple of days due to the four-plus feet of snow we’ve received in the last month or so. But you do have to download to get back to the Village. The true top-to-bottom skiing right now is over at Lionshead. I wouldn’t be surprised to see some additional terrain come online as we get toward the weekend. Game Creek Bowl looked imminently skiable. One more day of free parking on Thursday and then full pay mode starting on the originally scheduled opening day on Friday. Beaver Creek opens four days early on Saturday, so there’s that to look forward to, along with a minor storm Saturday into Sunday that could dust the slopes with some fresh snow and bring colder temperatures for snowmaking. Then forecasters say it will be Thanksgiving before the next storm rolls in. Wednesday was one of the better openings I’ve experienced in my 25 years in Vail, although not nearly as good as my first winter here, when Vail opened on Nov. 6, 1991. Somewhere I have a photo of me skiing mid-shin powder that day on Kangaroo Cornice. I would have posted it except the ski clothes were a little too embarrassing and I was wearing white, rear-entry boots. 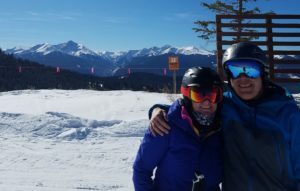 VAIL, Colo. – Nov. 14, 2018 – Following four feet of snow last week, Vail Mountain opened for the 2018-19 ski and snowboard season today, Nov. 14, two days ahead of the scheduled opening date of Nov. 16. Similarly, Beaver Creek Resort will open earlier than anticipated with a Nov. 17 scheduled opening, four days ahead of its previous Nov. 21 scheduled opening date. A combination of some of the best early-November snow and coldest snowmaking conditions in years at Vail allowed the resort to open with more than 600 skiable acres, accessed by seven lifts, including top-to-bottom skiing and riding via Lionshead Village.